Here's our latest round-up from the lower divisions of the Sussex Cricket League plus some local village, junior and friendly matches. 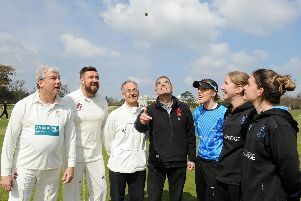 To get involved in our coverage email reports and team pictures to steve.bone@chiobserver.co.uk - and don't miss the Observer every week for all the local cricket coverage. Aldwick won at Selsey by 34 runs pushed then up the table and give them renewed impetus to challenge for a promotion place. Aldwick openers Ed White (44) and Alex Cooper (75) made their intentions clear from the start with a century opening partnership until White fell to Selsey skipper Tom Cripps (2-28). Cooper went on to bludgeon the bowling with 16 fours in his innings until his was run out by Farhan Bhutta. No3 Dean Stokes (60) made valuable runs while wickets fell around him, mainly to Brad Rose (3-27). A quick 26 from Harry Rossor near the end pushed the visitors total to a hefty 254-6 from their 40 overs. Chasing 255 for victory, Selsey were kept under control by the Aldwick opening bowling attack of Ben Bambridge (1-19) and Ian Horner (2-22), who removed openers Will Smith (16) and Asgar Bin Thariq (13) cheaply. However, Selsey were up for a fight and Bhutta (44) and big-hitting Brad Rose (83) gave them a scent of victory. Rose hit six sixes before he was bowled by Jamie Murphy (1-36) and additional wickets for Ollie Smith (3-34) curbed Selsey’s winning ambitions as they languished on 220-7 after their allotted 40 overs. Aldwick will plan for another maximum 30 points at home to Goring this week. At the Regis Oval, Bognor won the toss and batted on another fine day on the coast. Bognor were tickling along nicely at 90-2 but a slight collapse saw the home team finish on 155 all out, the no-nonsense Elvis Millen top-scoring with 43. For Goring, Oliver Wadesdon and Simon Legge grabbed four wickets apiece. Goring began the reply briskly but the entrance of the impish Jim Fallick bowling with panache and grabbing 3-24 pulled the initiative back to Bognor with Goring wobbling on 107-7. Alas for Bognor 38 for Sam Dunkley saw the visitors home by two wickets in a tight finish. Consistent batting from the Worthing batting line-up of Kieran O’Brien (50), Glen Harris (37), Patrick Morgan (34), and Patrick Box (26) gave their side a defendable final total of 211 all out. However, it could have been more but for the substantial efforts of Liam Hicks (3-38), the ever-improving youngster, Ben Cooper (3-37) and league debutant Oliver Duff (2-17) whose scalps included top-scorer O’Brien. Aldwick pushed for a win with top contributions from Dion Sampson (50), John Young (38), and Jonny Knapp (29) but were not able to reach their target and fell 23 short in the 36th all out for 188. Most of the wicket-taking damage was done by Thirumaleshwara Anup (4-44) and Michael Cane (3-23). Undeterred, Aldwick twos will fight on against Findon thirds this week. At the foot of the South Downs, Arundel’s batsmen made hay in accumulating 294-5, the hosts’ Sam Temple with 115 not out and Rod Peachey with 75. Bognor gave a valiant chase as the old maestro Nick Baker made 62 and along with young upstart Harry Lindsey with 42 not out kept Bognor tickling forward. However the target was a bridge too far and the hosts won this contest by 80 runs, Dan Marsden nabbing 4 for 59. Two more youngsters stepped up for their first adult game with Priory Park fourths. Middleton’s Rocco Gamalin was out for 48, Christian Bellamy scored 40 and Fraser Gamalin a tidy 38. Rhys Hall in his first game as keeper took two stumpings and Stanley Mayne notched 2-39 from nine overs. Jonathan Maynard with 1-27, Billy O’Brien 1-41 and Elliott Scott 1-40 off nine overs all bowsled well and Chi were busy in the field. A score of 194-5 was a reasonable challenge. Henry Whitby proved keen to guard his wicket and went on to score 71 not out, David Graham-Wood struck 50 from just 30 balls but was well bowled by Rocco Gamblin. Chichester gained 24 points to set them back on track in their new league in a super game with both sides playing very competitively. It was a pleasure to play on a glorious summer afternoon. Lavant won the toss and batted and Ian Rawnsley and Graham Dale continued their fine form, adding 73 for the first wicket before Dale was bowled for 31. Rawnsley and Tom Cole took the score to 148 before Cole was caught in the covers just four short of his 50. Rawnsley had support from Peter Burford (30no), which enabled skipper Steve Brooker to declare at 225-3. Rawnsley carried his bat for an unbeaten 91, a tremendous performance. IBM’s reply started slowly with Vikran caught in the gully by Brooker off Alex Burford. Hicks was caught at mid on by Dale also off Alex Burford. Two run-outs and three ducks later and IBM were struggling against the spin of Mark Sullivan and pace of Tom Cole and a good slip catch by Alex Burford. The skipper cleared up the tail, giving Lavant their second win of the season by 114 runs. On a delightful evening at Priory Park, Harelquins elected to bat with an electric outfield promising a high-scoring game. But Bognor’s youngsters kept a good line and length to restrict the hosts to 100, old warhorse and birthday boy Jon Whitewood and the upcoming Lulu Millen with two wickets apiece. In reply the lively Enrique Andrade-Paris and veteran maestro Nick Baker gave the innings a brisk start, both retiring on 25, but Harlequins’ experience showed as they restricted the run flow to win by 12 runs. At West Meads Park, Bognor’s ladies looked to continue their good run of form against Goring. Winning the toss and batting, skipper Tanya Wake and the excellent Kate De Lillis both retired after scoring 30 and with support from the demure Charlotte Vincent-Skinner, Bognor finished on 135-2. Wake and the wily Hannah Stemp both bagged a double of wickets to restrict the visitors and another miserly spell from De Lillis sealed the deal and Goring finished on 79-6, Bognor’s ladies winning by 56 runs. On a fine evening at the Regis Oval, the visitors chose to field. This proved to the liking of Bognor’s openers, the sedate Ben Woolnough and lively Mancunian Jack Hickman who both retired on 30 not out as Bognor’s innings ended on 107-2. The hosts then set about their business as the no-nonsense Elvis Millen and zippy Taylor Jaycocks grabbed two wickets apiece. This was not the main event as the coup-de-grace was applied by lively leg-spinner Ethan Teasdale grabbing 3-3 and helping to bowl out Pagham for 82, Bognor winning by 25 runs. Sunday was funday at the Regis Oval as Bognor’s batsmen made hay against Eastergate. Contributions from skipper Tom Woolnough, Elvis Millen and the returning Ben Hauxwell were the start as both Ben Woolnough and Ethan Teasdale retired on 40 not out, Bognor ending on 217-5 from their 20 overs. Eastergate’s reply was checked at the start by Ali Booker’s sweet swing grabbing the youngster two wickets for little runs; however the main course was dished up by Joe Delaney as the man with the magnificent fringe was a cut above grabbing 3-7 and putting the brakes on Eastergate. The visitors couldn’t gain momentum and ended on 101-8, Bognor winning by 116 runs.